Despite its skeptics and general negativity, there is often good news taking place in the world of harness racing and that came to light recently when Plainridge Park announced that the Spirit of Massachusetts Trot will be back in 2019 after a one-year hiatus. The move came as a pleasant surprise; usually, once an event is skipped, it rarely comes back. Kudos must be given to all parties and this shows that some of the racinos really do care about their harness racing product. The 2017 edition was a magnificent event with a record handle and a thrilling victory by JL Cruze. This year’s event will be contested on Sunday, July 28. The track’s 2019 schedule is out and features 108 racing days over 34 weeks. Most weeks feature a Monday-Thursday-Friday schedule, but there are six Sundays of racing too, highlighted by the aforementioned $250,000 Mass Trot, as well as the $100,000-added Clara Barton Distaff Pace. Last year, the track and horsemen couldn’t agree on terms, so the trot was cancelled. Like many tracks, there is the endless debate as to who should get the money. Having a race like this will bring in outsiders with nominations going through the Hambletonian Society, which governs the Grand Circuit. The local horsemen would rather see that $350,000 used to supplement overnight purses for those who make their living at Plainridge. It’s a fine line, but to me, there are more positives then negatives when a track has a signature event. Most tracks have at least one big event and the Spirit of Massachusetts Trot was a fine addition to the 2017 schedule. 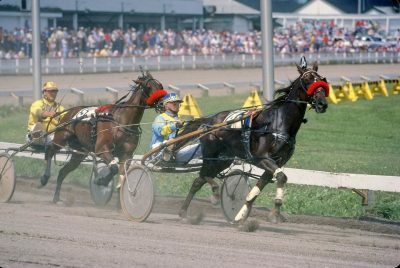 In that edition of the race, many of the best trotters invaded the Bay State and, when the smoke cleared, JL Cruze, pulled off a 60-1 upset in a track record time of 1:51.2 on the 5/8-mile racing surface. There were 40 nominations to that inaugural event, with nine making it to the starting gate. The top eight spots were based on earnings with the ninth spot being an at-large selection. The format remains the same for this year’s edition. So, how much does it cost to enter a $250,000 race that is overseen by the Hambletonian Society? The first step is to nominate your horse. This race is open to trotters ages 3 and up and a payment of $1,000 must be made by Feb. 15. On March 15, a payment of $1,500 must be made, with a final $2,500 entry fee paid right before the race. The total cost to enter is $5,000 and this race which will pay the standard percentages of 50, 25, 12, 8 and 5 percent. But because this is big stakes event, horses that finish 6 thru 9 are guaranteed $2,500 to entice more nominations; thus, for the horse owners, it’s really a $2,500 investment. In most races, only the top five finishers get paid. Still, dividing up $240,000 is not too shabby and, based on the standard percentages, the payouts will be $120,000, $60,000, $28,800, $19,200 and $12,000. The race is situated well six days before the Hambletonian and while it’s unlikely that a 3-year old will trot here and, then, do the same on the following Saturday at the Meadowlands, there’s a good chance that an older horse will use this race to prepare for a stakes race on the Hambletonian undercard. The same can be said for filly pacers who will square off in the Barton Pace. Harness racing survives on overnight races. Those races generate the handle each day or night that the tracks are open, but there is something to having that big event. People like big events and, for some, the big event might be the only time they visit a track. Think about the Hambletonian. In 2017 and 2018, paid attendance was over 18,000. Why? Because big events draw crowds—and, in 2017, the locals came out to Plainridge for the big event. I have a feeling they will come again this July for the Mass Trot. Plainridge Park opens its 2019 season on Monday, April 8, with closing day set for Friday, Nov. 29. Click HERE for the race schedule and post times. Having the Spirit of Massachusetts Trot back is a good thing for the track, the fans and the sport of Harness Racing. The big names came calling two years ago and I expect the same for the 2019 edition.